”ICA Vanadis, a Stockholm- based supermarket is currently deploying an experimental project involving digital signage, Facebook and mobile check-ins. The principle is simple: decrease the price of a product (chosen by the retailer) by simply checking in the shop using Facebook. Each marketing campaign of this kind takes one week and finishes on a Friday; the higher the number of customers checking-in during this time, the lower the price of that particular product. Once Friday, all the clients can enjoy the price reduction. 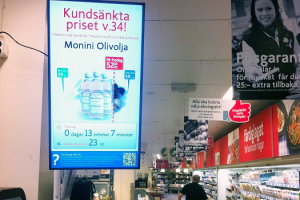 A digital screen has been installed in the store for informing customers about the undergoing project and initiate the desired interaction– QR codes and short URLs being displayed to allow a quick check-in. A dedicated website was launched in paralel, offfering clients the chance to track the product’s price decrease from home”. A win-win situation for everybody. More exposure, more clients and more sales for the supermarket- lower prices for the consumers. The new technologies such as cloud- based digital signage software (see our digitalsignage.NET) and the decrease in price of LCDs made the deployment and maintenance of digital signage systems much easier and less costly than they were a few years ago, allowing companies of all sizes to launch different experiments, such as this one. Now the campaign’s success depends on several factors among which: 1) the attractiveness of the products offered for discount 2) the visibility of the screen (announcing the campaign in-store) and 3) the overall buzz around it. We shall conclude by stating that this innovative idea is just one of the many ways in which digital signage can be used to enhance a store’s marketing and communications efforts. This entry was posted in Digital Signage, Marketing and Advertising, Retail and tagged digital signage, digital signage advertising, Digital signage retail by Dynamax. Bookmark the permalink.